This invention by Körbach, the Körbach Frame Locks, is very easy to install. The most time will be spent removing the bumper and a few other things to gain access to the mounting location, doing mock up work to make sure everything fits, and reinstalling the things you removed. The actual installation does not take long at all. If you read the very adequate thirty page installation manual ahead of time, and have all the necesary tools handy, this install should take you around an hour...even if you have to remove the stock intake resonator. It is a good idea to make sure you have everything before you get started. 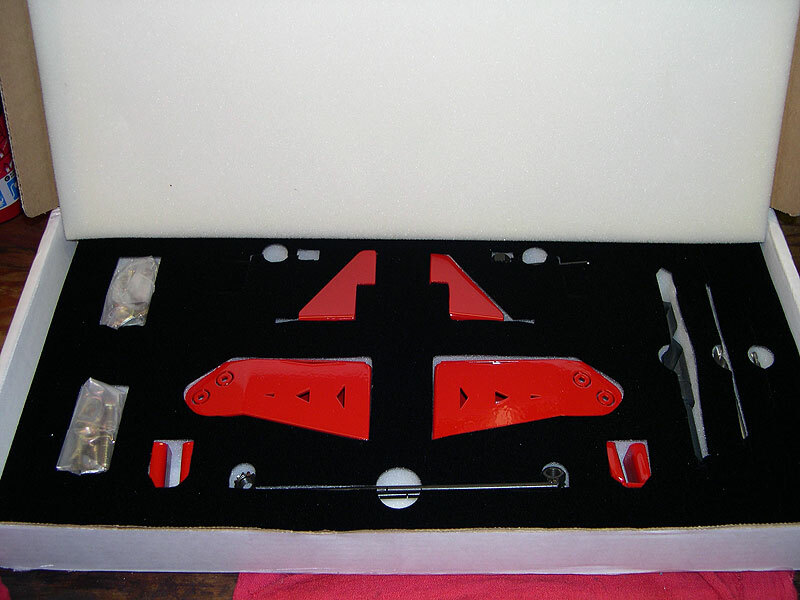 So lets open up the box and take a peek, then spread out the parts for each side to make sure everything is there. Körbach obviously cares about presentation...this packaging is the best I have ever seen. Here are the parts for the right side, note the included drill bits. 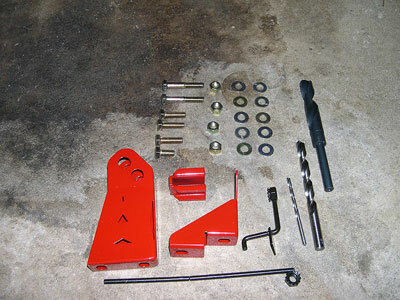 You should have all of these parts for the left side as well, minus more drill bits. Once you are sure you have everything, go ahead and jack up the front of the car to start so you will have adequate room to work...especially if you have lowered your car any. 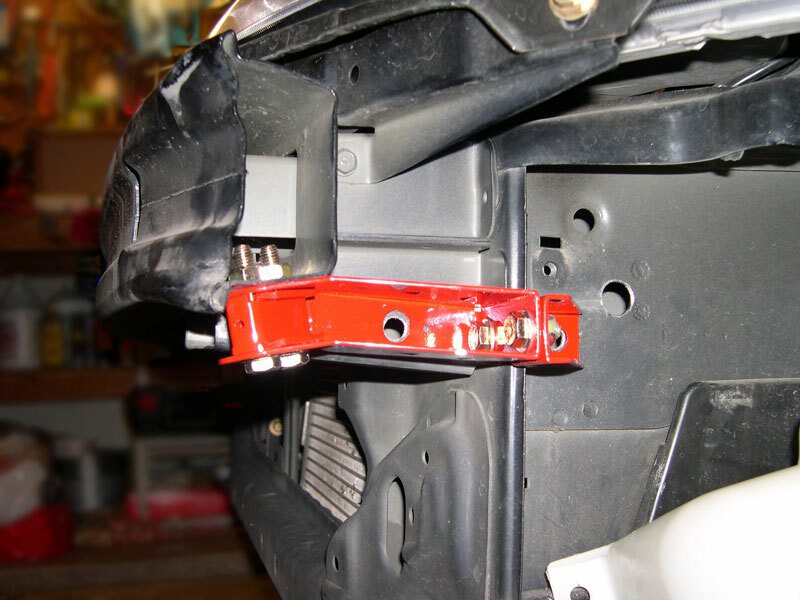 After you have the car raised, and supported with jack stands, you will need to raise the hood to gain access to seven clips on the top of the bumper. To remove the bumper cover, you need to first remove a screw under the bumper inside each front wheel well, then remove two Phillips head screws under the front of the bumper on each side, then two 10mm bolts from under the front of the bumper near the middle, and finally you need to remove each of the clips along the top of the bumper using the small flathead screwdriver. 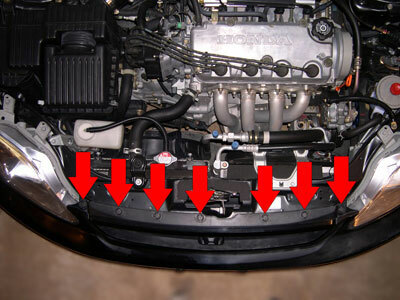 Once you have all of these removed you will be able to remove the bumper cover. You need to remove these (7) clips with a small flathead screwdriver. Once you have the bumper cover off, you can get started with the pre-installation tasks. Körbach suggests test fitting everything before final installation, just to make sure everything lines up before drilling into your car. 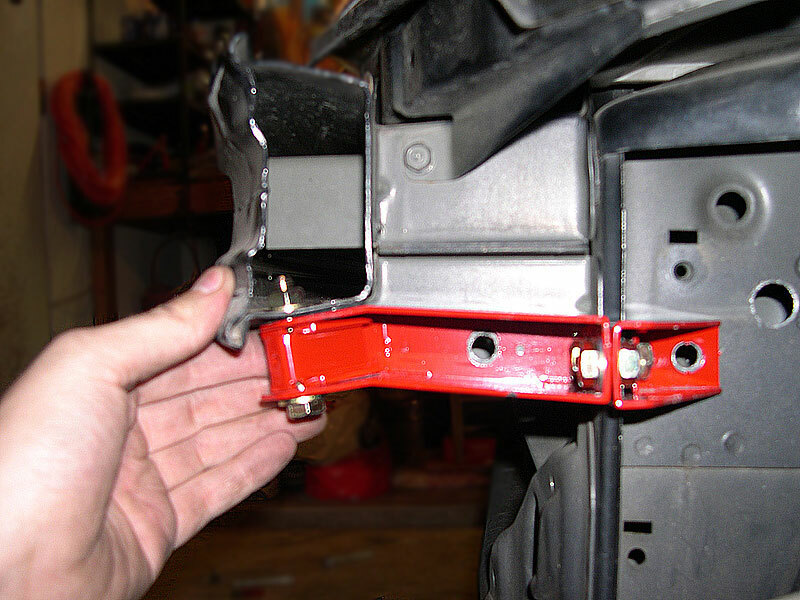 If your car has been in a front end collision, there is a good chance that the brackets will not line up properly. We are going to start on the passenger side, and if you still have your stock intake resonator box, it will have to come off. It is generally held on with an assortment of 10mm hex bolts, which should be easy to spot. After getting that out of the way, you need to remove a 12mm hex bolt so you can start the mock up. This bolt is replaced by a longer one supplied by Körbach, so it is no longer needed. Next you will temporarily install the front and rear brackets. The location of these brackets will determine the location of the pilot holes you drill, so you must take your time here and make sure you get it right; if the gap is too big anywhere, you may have a hard time getting everything to fit right during final assembly...compromising the integrity of the parts. First, install the front bracket using a supplied washer and 13mm hex bolt 25mm in length through the hole you just removed the bolt from. You want the bracket to be touching the bumper extension and the bumper beam. 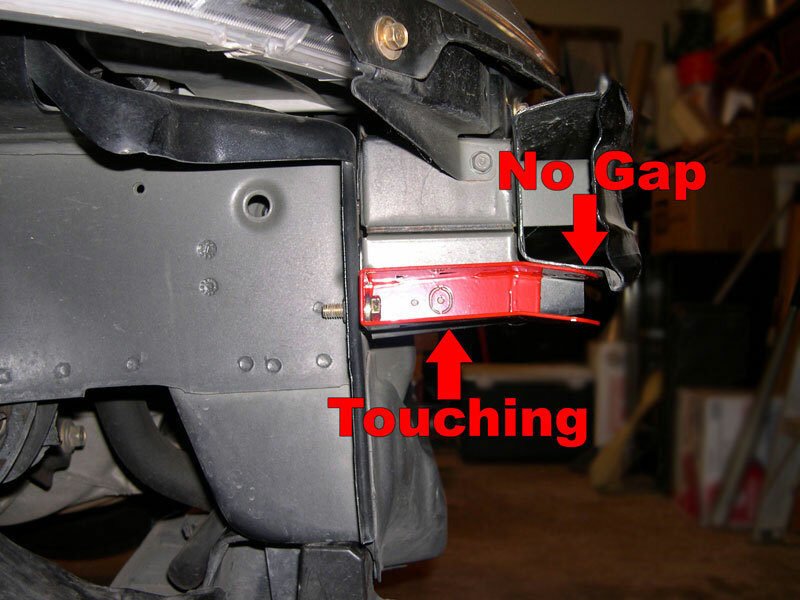 If possible, you want no gap at all between the bumper beam and the top of the bracket. 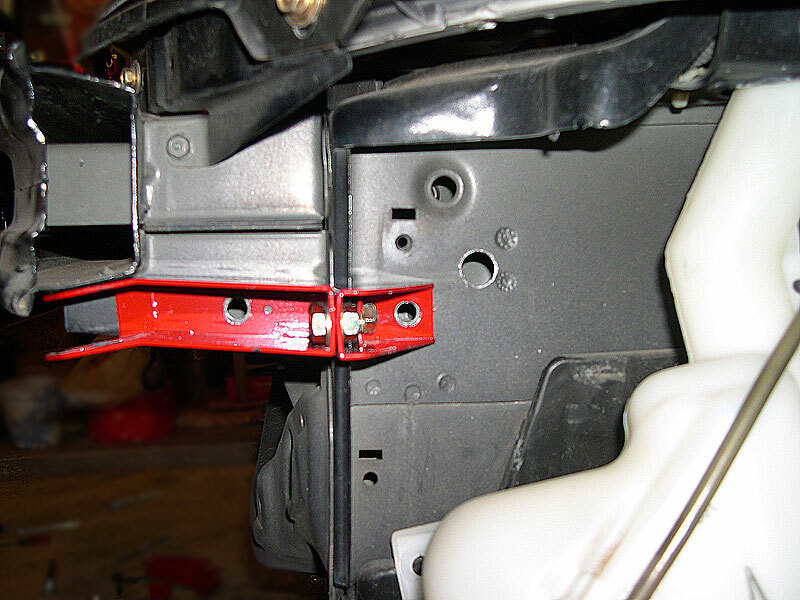 You should torque the bolt to 20 ft-lb after the bracket is properly aligned. The bracket should be touching the bumper extension and the bumper beam with no gap if possible. Now you will temporarily install the rear bracket. Again, you want the bracket touching the car body. 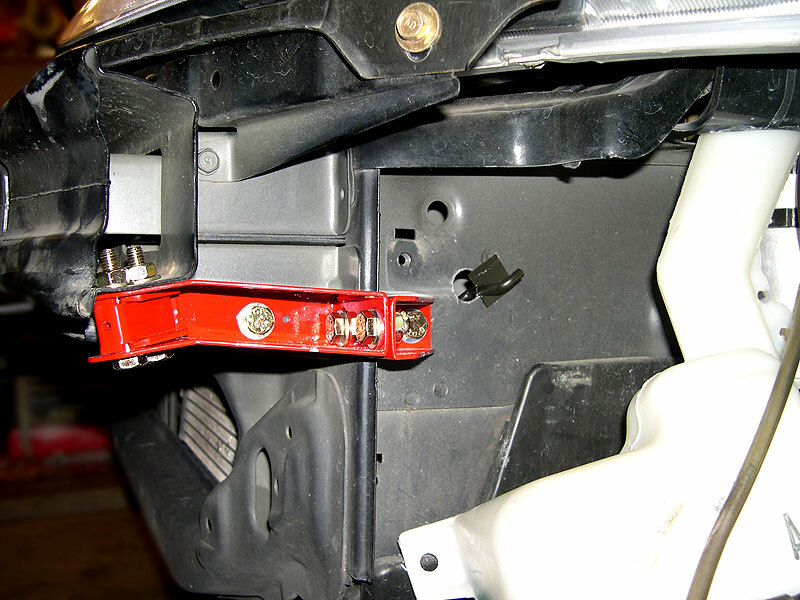 Once you have the bracket touching the car body, and the bolt holes lined up, insert a washer and 13mm hex bolt 16mm in length through the front hole, from the front, and a washer and nut from the rear, then torque them to 20 ft-lb. 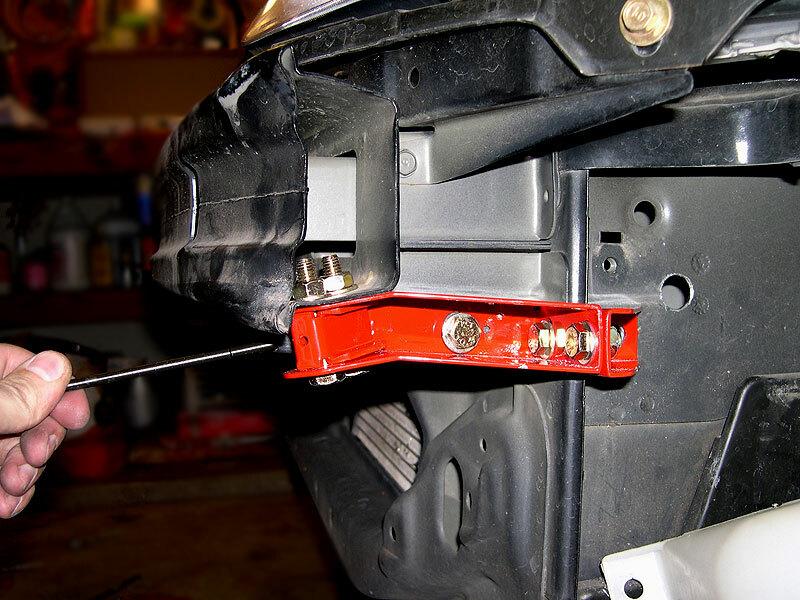 Now install a washer and nut on the rear bolt, and torque to 20 ft-lb. The bracket should be touching the car body. 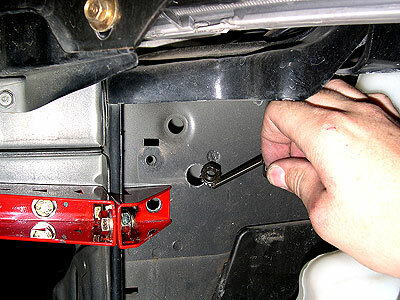 At this point, if you cannot get the bolt through the front hole, then your car has most likely been in a front end collision and the Frame Locks might not fit. If this is the case, you will need to contact Körbach directly to arrange for a FULL refund. If, however, everything goes smoothly and you get this side installed, you will need to switch to the driver's side and do the same test fit over there BEFORE drilling any holes. On the driver's side, you will need to lower the washer fluid reservoir in order to gain access to the Frame Lock mounting location. 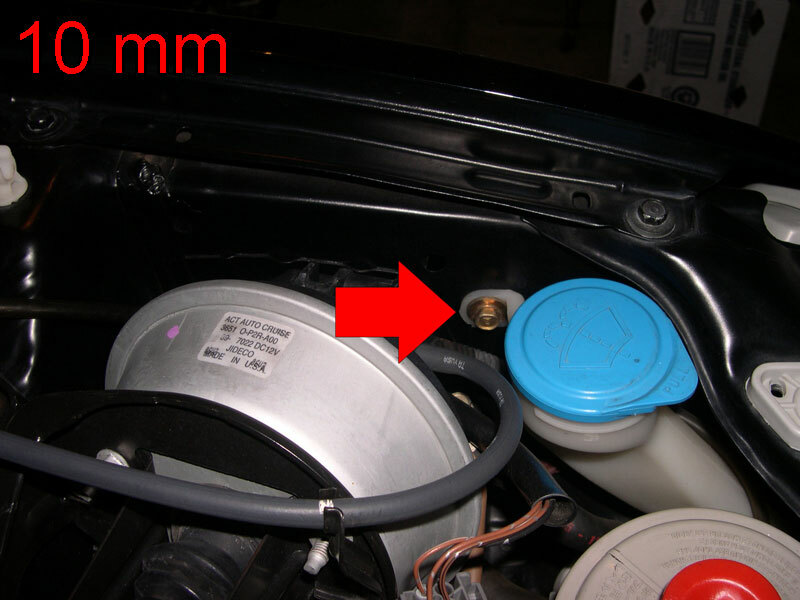 To do this you will need to remove a 10mm bolt from the top of the reservoir, two 10mm bolts from the bottom, and then pull the reservoir down 8 - 10 inches. Remove (2) 10mm hex bolts. 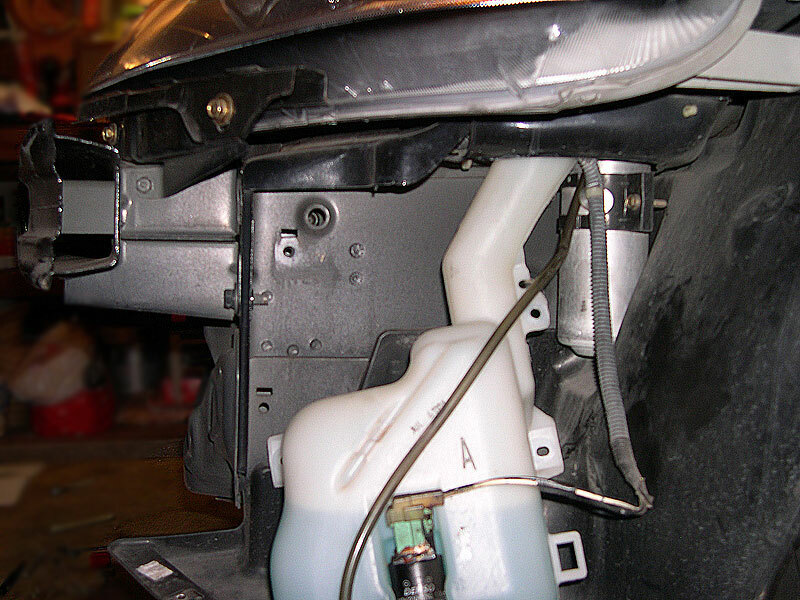 Once you have this done, simply repeat the steps you used to test fit the passenger side Frame Locks. If all is well, you can move on to drilling the pilot holes. For this task, you either need a corded drill, or a very powerful cordless drill...my 24v Black & Decker had no problems here. You will also need to put on some safety glasses to protect your eyes from the flying shards of metal, some of you also might want to put on a long sleeve shirt and gloves, as those shards are very hot when they hit you. I toughed it out. For the pilot holes, you need to use the smallest drill bit included in the kit, the 5/32" one. Simply insert the bit in the small holes in the break away pieces, and drill your pilot holes, there will be (5) on each side. 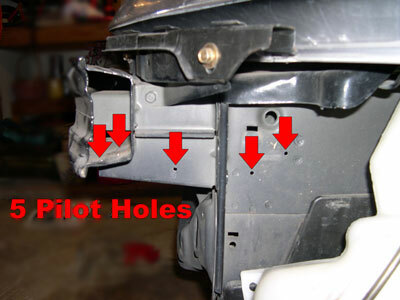 After drilling the pilot holes, you will need to uninstall the brackets in order to enlarge the holes. Once you have them removed, you need to enlarge (4) holes with the 3/8" bit, and (1) hole with the 5/8" bit, the largest one being the rearmost hole. Drill out the pilot holes with the included 5/32" bit. Enlarge the pilot holes with the included 3/8" and 5/8" bits. Now that the holes are drilled, you will remove the break away pieces that you used to line up the pilot holes. 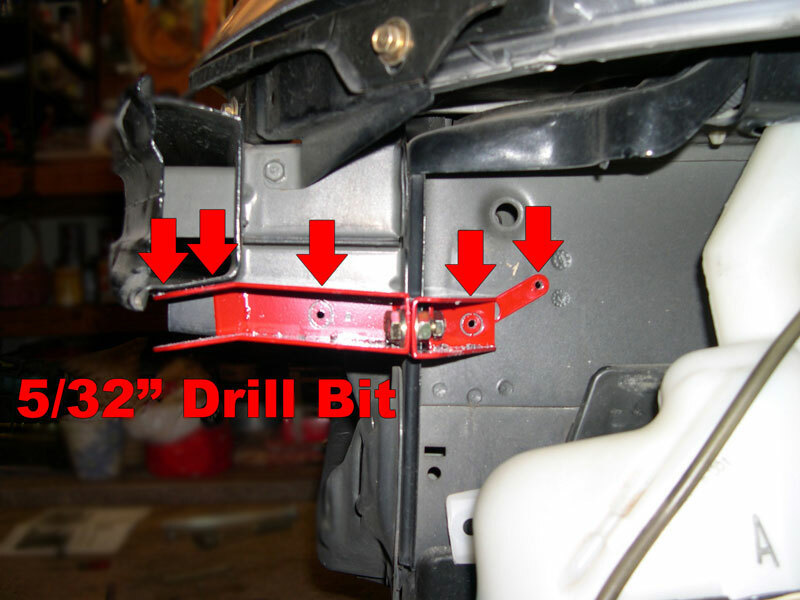 You can use the 5/32" drill bit for this task. Remove the break away pieces. After you get those break away pieces out, it is time to start final assembly of the Frame Locks. Install the front bracket first, just like during the mock up, then the rear bracket. Remember to use washers on all of the bolts, and under all of the nuts, and to torque them to 20 ft-lb after getting them lined up. At this point, the holes you just drilled should line up perfect. The next step will be to install the thru bolt piece, and it is at this point you start to see how sturdy these little brackets will be. First you need to install a 13mm hex bolt 45mm in length finger tight into the front of the two holes into the bumper beam...do not forget the washers. 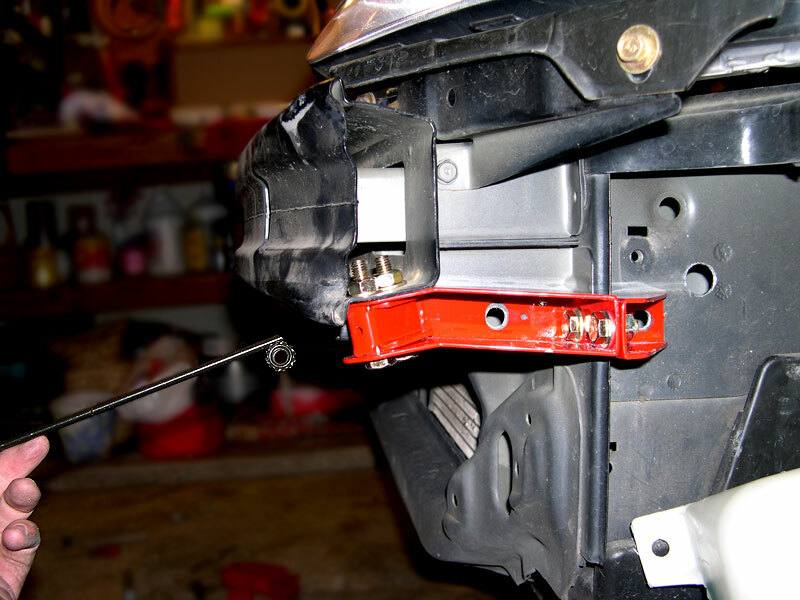 After you have that front bolt in, you can slip the thru piece around it, and then install the second bolt. It can be difficult to install the thru piece if you install both bolts first, so just install the front one finger tight, then push in the thru piece. Install the rear bolt finger tight. Torque both bolts to 20 ft-lb. 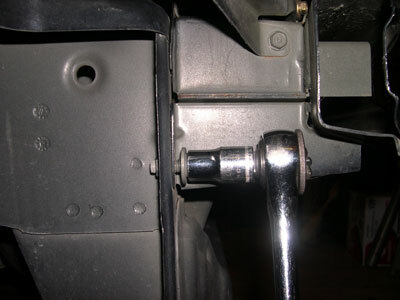 After you have the front bolts and the thru piece installed, you will start with the front stick nut. 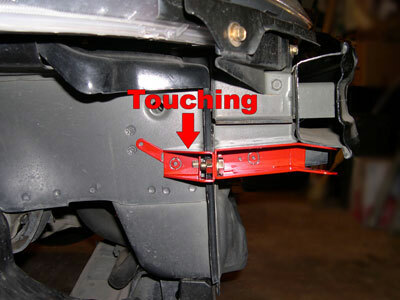 This is basically a nut on a stick, just as it sounds, that allows you to reach the nut up into the bumper extension. You will reach this stick nut up to the front of the two remaining holes, and install a 13mm hex bolt 25mm in length, and a washer, into it, and torque it to 20 ft-lb. Grab your stick nut and get ready to fish it into the bumper extension. Install the bolt and washer and torque to 20 ft-lb. Next we do the rear stick nut. This one will be inserted through the rearmost hole, which is also the largest hole. Simply insert it into that hole, line the nut up behind the only remaining hole, and insert a 13mm hex bolt 25mm in length, along with a washer, into it, and then torque to 20 ft-lb. Grab your stick nut and get ready to fish it into the body. Now you need to go back and torque all the nuts and bolts to 20 ft-lb one last time, and then break off the stick nuts. Break off the stick nuts. 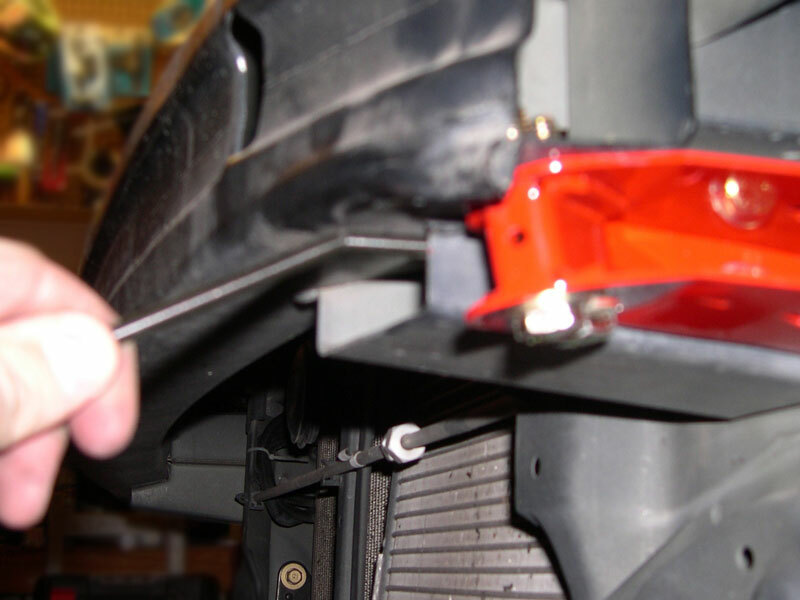 Now you need to repeat these final assembly steps on the other side of the car, reinstall your washer reservoir and bumper cover, and you are finished. 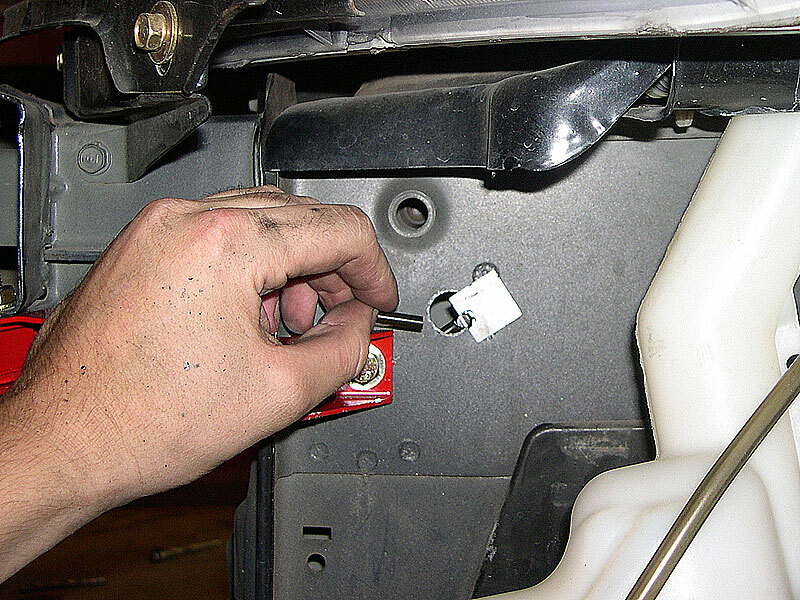 [b]6th Gen (6G) Honda Civic Korbach Framelock Install[/b] Article By [url=http://georgebelton.com]George Belton[/url] This invention by K�rbach, the Korbach Frame Locks, is very easy to install. 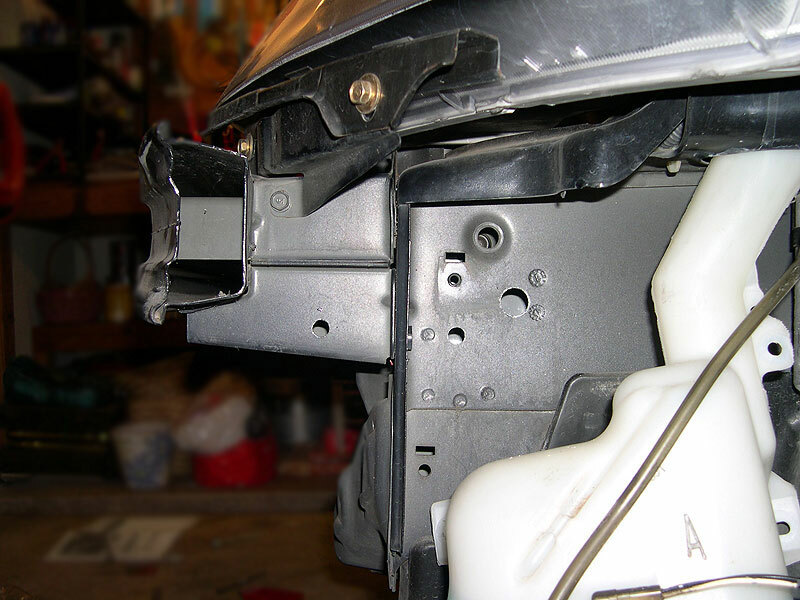 The most time will be spent removing the bumper and a few other things to gain access to the mounting location, doing mock up work to make sure everything fits, and reinstalling the things you removed. The actual installation does not take long at all. If you read the very adequate thirty page installation manual ahead of time, and have all the necesary tools handy, this install should take you around an hour...even if you have to remove the stock intake resonator. 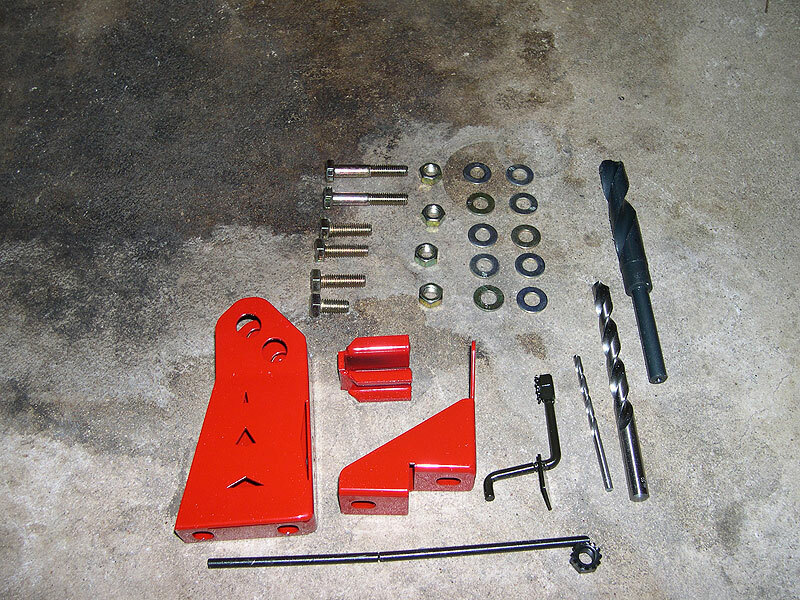 Items to gather before you start: - Jack and Jack stands - Lug wrench (might need it, I did not) - Ratchet - 3" extension - 6" extension - 8mm, 10mm, 12mm, 13mm sockets - 10mm, 13mm boxend wrenchs - Torque wrench - Drill (corded or heavy duty) - Safety Glasses - Phillips screwdriver - Small flathead screwdriver - Included drill bits (5/32", 3/8", 5/8") It is a good idea to make sure you have everything before you get started. So lets open up the box and take a peek, then spread out the parts for each side to make sure everything is there. K�rbach obviously cares about presentation...this packaging is the best I have ever seen. [img]http://georgebelton.com/6g.civic.tech/korbach.framelocks/korbach_01.th.jpg[/img] Here are the parts for the right side, note the included drill bits. You should have all of these parts for the left side as well, minus more drill bits. [img]http://georgebelton.com/6g.civic.tech/korbach.framelocks/korbach_02.th.jpg[/img] Once you are sure you have everything, go ahead and jack up the front of the car to start so you will have adequate room to work...especially if you have lowered your car any. After you have the car raised, and supported with jack stands, you will need to raise the hood to gain access to seven clips on the top of the bumper. To remove the bumper cover, you need to first remove a screw under the bumper inside each front wheel well, then remove two Phillips head screws under the front of the bumper on each side, then two 10mm bolts from under the front of the bumper near the middle, and finally you need to remove each of the clips along the top of the bumper using the small flathead screwdriver. Once you have all of these removed you will be able to remove the bumper cover. 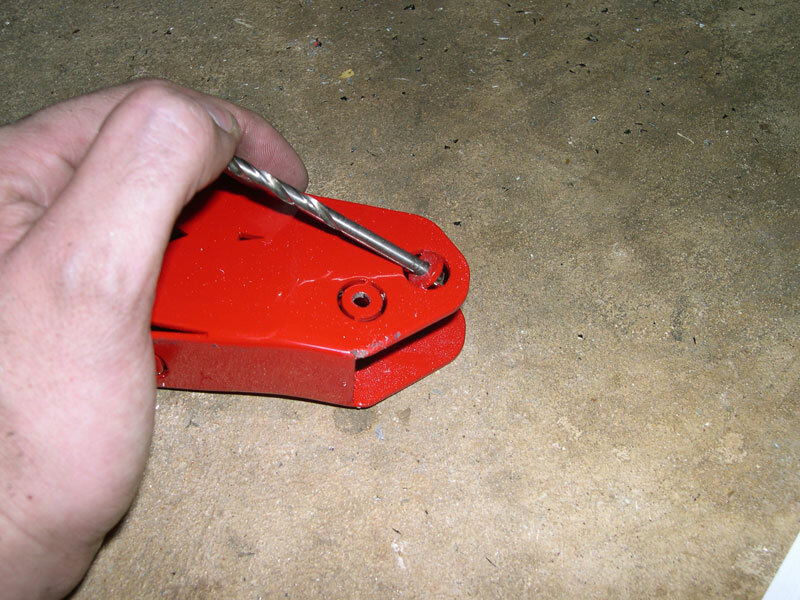 You need to remove these (7) clips with a small flathead screwdriver. [img]http://georgebelton.com/6g.civic.tech/korbach.framelocks/korbach_03.th.jpg[/img][img]http://georgebelton.com/6g.civic.tech/korbach.framelocks/korbach_04.th.jpg[/img] Once you have the bumper cover off, you can get started with the pre-installation tasks. K�rbach suggests test fitting everything before final installation, just to make sure everything lines up before drilling into your car. If your car has been in a front end collision, there is a good chance that the brackets will not line up properly. We are going to start on the passenger side, and if you still have your stock intake resonator box, it will have to come off. It is generally held on with an assortment of 10mm hex bolts, which should be easy to spot. After getting that out of the way, you need to remove a 12mm hex bolt so you can start the mock up. This bolt is replaced by a longer one supplied by K�rbach, so it is no longer needed. Remove 12mm hex bolt. [img]http://georgebelton.com/6g.civic.tech/korbach.framelocks/korbach_05.th.jpg[/img] Next you will temporarily install the front and rear brackets. The location of these brackets will determine the location of the pilot holes you drill, so you must take your time here and make sure you get it right...if the gap is too big anywhere, you may have a hard time getting everything to fit right during final assembly...compromising the integrity of the parts. First, install the front bracket using a supplied washer and 13mm hex bolt 25mm in length through the hole you just removed the bolt from. You want the bracket to be touching the bumper extension and the bumper beam. If possible, you want no gap at all between the bumper beam and the top of the bracket. You should torque the bolt to 20 ft-lb after the bracket is properly aligned. 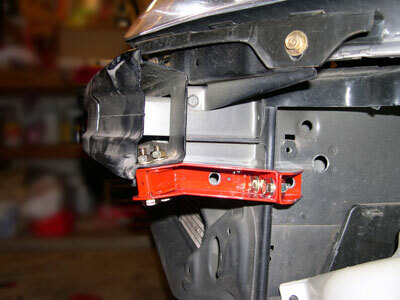 The bracket should be touching the bumper extension and the bumper beam with no gap if possible. [img]http://georgebelton.com/6g.civic.tech/korbach.framelocks/korbach_06.th.jpg[/img] Now you will temporarily install the rear bracket. Again, you want the bracket touching the car body. 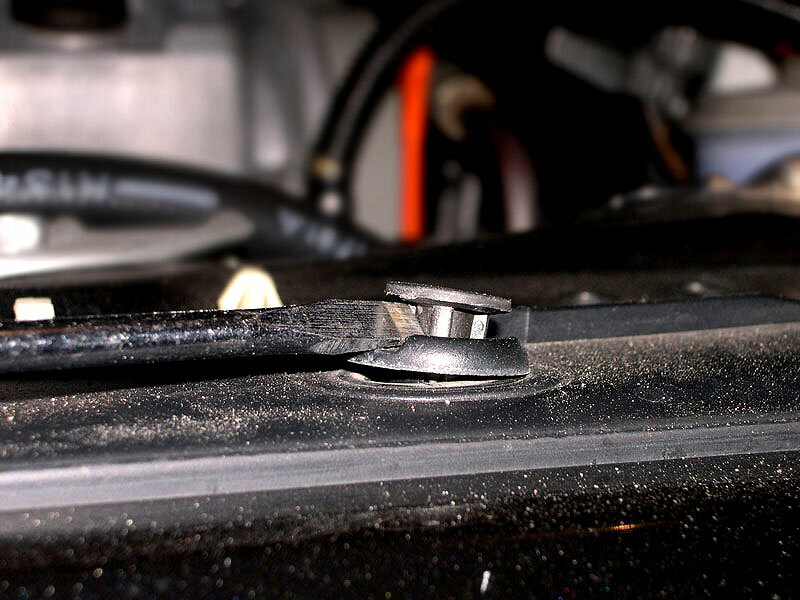 Once you have the bracket touching the car body, and the bolt holes lined up, insert a washer and 13mm hex bolt 16mm in length through the front hole, from the front, and a washer and nut from the rear, then torque them to 20 ft-lb. Now install a washer and nut on the rear bolt, and torque to 20 ft-lb. The bracket should be touching the car body. [img]http://georgebelton.com/6g.civic.tech/korbach.framelocks/korbach_07.th.jpg[/img] At this point, if you cannot get the bolt through the front hole, then your car has most likely been in a front end collision and the Frame Locks might not fit. If this is the case, you will need to contact K�rbach directly to arrange for a FULL refund. 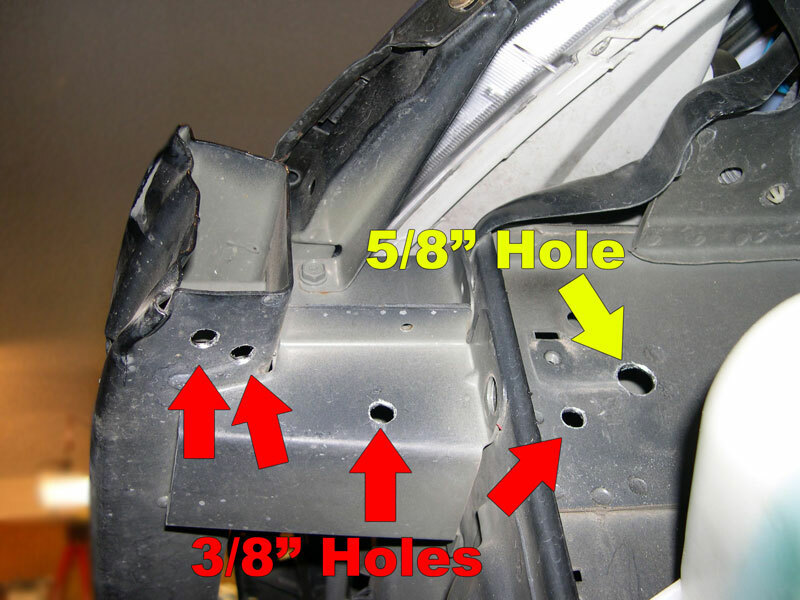 If, however, everything goes smoothly and you get this side installed, you will need to switch to the driver's side and do the same test fit over there BEFORE drilling any holes. 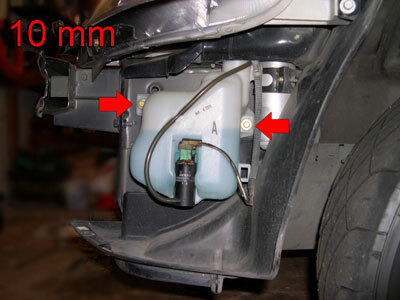 On the driver's side, you will need to lower the washer fluid reservoir in order to gain access to the Frame Lock mounting location. To do this you will need to remove a 10mm bolt from the top of the reservoir, two 10mm bolts from the bottom, and then pull the reservoir down 8 � 10 inches. Remove 10mm hex bolt. [img]http://georgebelton.com/6g.civic.tech/korbach.framelocks/korbach_08.th.jpg[/img] Remove (2) 10mm hex bolts. [img]http://georgebelton.com/6g.civic.tech/korbach.framelocks/korbach_09.th.jpg[/img] Pull washer reservoir down 8 � 10 inches [img]http://georgebelton.com/6g.civic.tech/korbach.framelocks/korbach_10.th.jpg[/img] Once you have this done, simply repeat the steps you used to test fit the passenger side Frame Locks. If all is well, you can move on to drilling the pilot holes. For this task, you either need a corded drill, or a very powerful cordless drill...my 24v Black & Decker had no problems here. You will also need to put on some safety glasses to protect your eyes from the flying shards of metal...some of you also might want to put on a long sleeve shirt and gloves, as those shards are very hot when they hit you...I toughed it out. For the pilot holes, you need to use the smallest drill bit included in the kit, the 5/32" one. Simply insert the bit in the small holes in the break away pieces, and drill your pilot holes, there will be (5) on each side. After drilling the pilot holes, you will need to uninstall the brackets in order to enlarge the holes. Once you have them removed, you need to enlarge (4) holes with the 3/8" bit, and (1) hole with the 5/8" bit...the largest one being the rearmost hole. Drill out the pilot holes with the included 5/32" bit. [img]http://georgebelton.com/6g.civic.tech/korbach.framelocks/korbach_11.th.jpg[/img][img]http://georgebelton.com/6g.civic.tech/korbach.framelocks/korbach_12.th.jpg[/img] Enlarge the pilot holes with the included 3/8" and 5/8" bits. [img]http://georgebelton.com/6g.civic.tech/korbach.framelocks/korbach_13.th.jpg[/img][img]http://georgebelton.com/6g.civic.tech/korbach.framelocks/korbach_14.th.jpg[/img] Now that the holes are drilled, you will remove the break away pieces that you used to line up the pilot holes. You can use the 5/32" drill bit for this task. Remove the break away pieces. [img]http://georgebelton.com/6g.civic.tech/korbach.framelocks/korbach_15.th.jpg[/img] After you get those break away pieces out, it is time to start final assembly of the Frame Locks. Install the front bracket first, just like during the mock up, then the rear bracket. Remember to use washers on all of the bolts, and under all of the nuts, and to torque them to 20 ft-lb after getting them lined up. At this point, the holes you just drilled should line up perfect. Make sure your holes line up and torque to 20 ft-lb [img]http://georgebelton.com/6g.civic.tech/korbach.framelocks/korbach_16.th.jpg[/img] The next step will be to install the thru bolt piece, and it is at this point you start to see how sturdy these little brackets will be. First you need to install a 13mm hex bolt 45mm in length finger tight into the front of the two holes into the bumper beam...do not forget the washers. 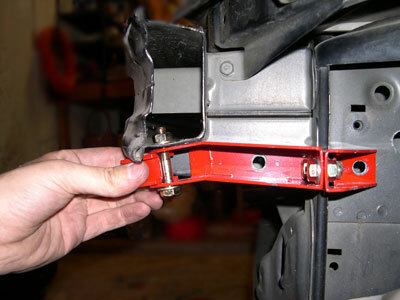 After you have that front bolt in, you can slip the thru piece around it, and then install the second bolt. >It can be difficult to install the thru piece if you install both bolts first, so just install the front one finger tight, then push in the thru piece. [img]http://georgebelton.com/6g.civic.tech/korbach.framelocks/korbach_17.th.jpg[/img][img]http://georgebelton.com/6g.civic.tech/korbach.framelocks/korbach_18.th.jpg[/img] Install the rear bolt finger tight. [img]http://georgebelton.com/6g.civic.tech/korbach.framelocks/korbach_19.th.jpg[/img] Torque both bolts to 20 ft-lb. [img]http://georgebelton.com/6g.civic.tech/korbach.framelocks/korbach_20.th.jpg[/img] After you have the front bolts and the thru piece installed, you will start with the front stick nut. This is basically a nut on a stick, just as it sounds, that allows you to reach the nut up into the bumper extension. You will reach this stick nut up to the front of the two remaining holes, and install a 13mm hex bolt 25mm in length, and a washer, into it, and torque it to 20 ft-lb. Grab your stick nut and get ready to fish it into the bumper extension. [img]http://georgebelton.com/6g.civic.tech/korbach.framelocks/korbach_21.th.jpg[/img] Install the bolt and washer and torque to 20 ft-lb. [img]http://georgebelton.com/6g.civic.tech/korbach.framelocks/korbach_22.th.jpg[/img] Next we do the rear stick nut. This one will be inserted through the rearmost hole, which is also the largest hole. Simply insert it into that hole, line the nut up behind the only remaining hole, and insert a 13mm hex bolt 25mm in length, along with a washer, into it...then torque to 20 ft-lb. Grab your stick nut and get ready to fish it into the body. [img]http://georgebelton.com/6g.civic.tech/korbach.framelocks/korbach_23.th.jpg[/img] Install the bolt and washer and torque to 20 ft-lb. [img]http://georgebelton.com/6g.civic.tech/korbach.framelocks/korbach_24.th.jpg[/img] Now you need to go back and torque all the nuts and bolts to 20 ft-lb one last time, and then break off the stick nuts. Break off the stick nuts. [img]http://georgebelton.com/6g.civic.tech/korbach.framelocks/korbach_25.th.jpg[/img][img]http://georgebelton.com/6g.civic.tech/korbach.framelocks/korbach_26.th.jpg[/img] Now you need to repeat these final assembly steps on the other side of the car, reinstall your washer reservoir and bumper cover, and you are finished. [url=http://georgebelton.com/6g.civic.tech/korbach.framelocks/review.php]View The Product Review. [/url] You can find the full article with links to larger images [url=http://www.georgebelton.com/6g.civic.tech/korbach.framelocks/index.php]HERE[/url].